"Sounds like we got trouble in River City… Good citizens, make your check payable to Cruz Against Soviet Healthcare. Or just 'CASH'"
Those in the political world with nothing better to do Friday night were transfixed on C-SPAN or Twitter, following along with Sen. Ted Cruz's (R-TX) speech 1 in Des Moines to the Republican Party of Iowa. Among those were members of the hard-to-define "Republican Establishment." The best way to describe the establishment is that they are the people who think that the 87 House Republicans who voted to end the government shutdown and increase the debt limit two weeks ago cast a smart vote, as opposed to the 144 other Republicans in the House who didn't. Murphy (@murphymike 2), an alum from John McCain's rogue 2000 presidential campaign and a Meet the Press regular, was one of the establishment Republicans tweeting snark about Cruz during his speech (example above). Another was Alex Castellanos (@alexcast 3), best known these days as a commentator on CNN. In response to a Cruz comment that dumping every Washington strategist in the ocean would be "a good start," Castellanos cracked that he could "recommend a good finish." To the establishment, Cruz is the embodiment of all the forces conspiring to threaten the GOP's long-term viability. And, on a personal level, they also just can't stand Cruz: He drives them crazy. Ever since he's been elected, we here at the Crystal Ball have heard groaning from Democrats and Republicans alike about how much they dislike Cruz, and this venom directed toward the junior senator from Texas has been widely 4 reported 5. Not pleasing the establishment is music to the ears of Tea Party activists, and if anything the shutdown has endeared Cruz even more to them. 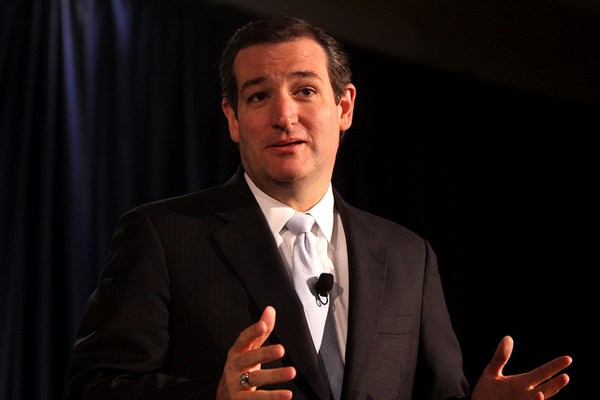 Assuming Cruz mounts a presidential bid in 2016 -- he's headed to South Carolina next week after his Iowa appearance last Friday (hint, hint) -- the Tea Party could be a potent base. But it's important to remember that in presidential nomination contests, the elites -- elected officials and party leaders -- are historically more important than the grassroots. In their 2008 book 6 The Party Decides, political scientists Marty Cohen, David Karol, Hans Noel and John Zaller analyzed endorsements in presidential primary contests made prior to the Iowa caucuses from 1980 to 2004. The candidate who had won the biggest share of endorsements won the eventual nomination in nine of 10 competitive contests (the exception was Democrat John Kerry in 2004). In 2012, Mitt Romney won more pre-Iowa caucus endorsements from sitting members of Congress and governors than all of his GOP primary opponents combined, according to a count from the new book 7 The Gamble by political scientists John Sides and Lynn Vavreck. However, many Republican leaders stayed on the sidelines in the pre-caucus endorsement battle, which was similar to 1980, when Ronald Reagan (the insurgent of 1976 turned favorite) also struggled to consolidate establishment support. Still, Reagan and Romney started their respective primary seasons as favorites who attracted more elite support than their opponents. Both ended up winning decisively, if not easily. At this point, it's hard to imagine Cruz winning much support from party elites, so he'd have to depend on the Tea Party grassroots. The non-elites sometimes get their wish when picking presidential candidates -- in 1964, the Republicans went off the reservation to pick Barry Goldwater, and in 1972 the Democrats did the same thing in selecting George McGovern. Those were also years when the pre-election fundamentals seemed to suggest that the incumbents (Lyndon Johnson in 1964, Richard Nixon eight years later) were in a strong position to win reelection. So, in effect, the party bases were playing with house money -- if you're gonna lose, might as well do so in style -- even if they probably wouldn't admit it at the time. Some Republicans may be similarly tempted to throw the dice with the shadow of Hillary Clinton looming over the 2016 field and the soul of the GOP at stake 8, but it's hard for any party to win three straight presidential elections, and it is also unclear how popular President Obama will (or won't) be in 2016 and what the state of the economy will be (two big factors that will help determine the next president). In other words, it would behoove Republicans to nominate the candidate they believe is most electable in 2016. At this early point, it's hard to imagine Republican officeholders will want to hitch their wagons to Cruz, who is not viewed favorably nationally 9. Cruz himself may realize that problems with his fellow elected Republicans could cause him political trouble down the road -- perhaps that's why he's taking steps to disassociate himself from the Senate Conservatives Fund, an outside group that tries to defeat GOP Senate incumbents, as Politico reported late Wednesday 10. Establishment backing actually plays a formal role in the Democratic presidential primary process, as readers will remember from the "superdelegate" battles in 2008. As late as early May 2008, Clinton actually retained an edge in superdelegates 12 over Obama according to a New York Times count, even as it was becoming clear she would not be the nominee. By the end of the primary season, the superdelegates saw the writing on the wall and swung heavily to Obama. But elite support didn't deliver the nomination to Clinton in 2008. So while there is plenty of recent support for the idea that the early favorite of party leaders wins presidential nominations, there are exceptions, too. Ted Cruz is riding high in some Republican/Tea Party circles precisely because he aggravates many high-ranking members of his own party. But his icy relationship with those party leaders might cause him problems if and when he decides to run for president. A recent history of party endorsements shows that they can be an indicator of who wins presidential nominations, and someone other than Cruz -- someone who has not burned so many bridges with other prominent members of his party -- is likely to attract that establishment support during the run-up to the Iowa caucuses two years from now. Photo above 13: Then-U.S. Senate candidate Ted Cruz of Texas speaking at the 2012 Liberty Political Action Conference in Chantilly, VA. Gage Skidmore 14 took the photo, which is published under a Creative Commons license through Flickr.